I was drawn to this collection of short stories by two things; first off, the cover is gorgeously designed, evoking both the period setting of many of the stories – the 1950s and 1960s – and the unsettling, off-kilter themes that resonate throughout the collection. Secondly, I’d heard of Millhauser’s story “Eisenheim the Illusionist“, which was adapted into a film that was unfairly compared to The Prestige because they were both period stories about magicians. I liked the movie enough that I wanted to know more about the author, although I’ve read that the story is very different from the movie. It’s rare to find a truly consistent short story collection; in my experience, even the best authors swings and misses in this kind of collection. I read Neil Gaiman’s Fragile Things earlier this year, and those stories alternated between gorgeous, disturbing, and incredibly slight. 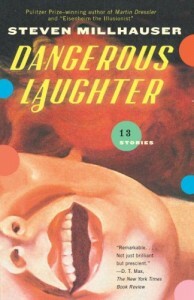 Dangerous Laughter has a few stories that I felt miss the mark, but by and large Millhauser’s collection is one of the strongest I’ve read in a long time. The stories alternate between macro-level narratives that read more like entries in a history book, and more personal stories that focus on specific characters. In general, my favorite stories fell in the latter category, but all of the stories in this volume have something to recommend them. The first truly stunning one is “The Room in the Attic”, which tells the story of a young man who befriends a girl that lives in darkness. During his junior year at school, the narrator, David, befriends an odd, bookish new kid named Wolf. One day Wolf invites David over to his house and introduces him to his sister, Isabel, who lives in the attic room and keeps her lights turned off at all times. Wolf tells David that she is recovering from a nervous breakdown, but that she seems to like him, and David begins regularly visiting Isabel in her attic room. They dance together in the dark, play games, and talk about anything and everything. Soon enough David is spending more and more time with Isabel, and can think of nothing else but his daily visit. Eventually the idea of Isabel looms in David’s mind, and her invisibility becomes an indelible part of her personality for him, until he is no longer sure he wants to see her face. I loved the way this story every-so-gently tweaked reality and played with symbolism; it manages to fill something seemingly mundane with incredible power. The title story, “Dangerous Laughter”, also plays with something apparently normal that becomes twisted and strange. It focuses on one summer when a group of students start playing a game where they gather in secret and laugh as loud and long as they possibly can, until they are exhausted, spent. Eventually they form laughter salons, each with its own specialty, and the games start turning into a ritual. The laughter salons seem both innocent and deeply, darkly personal; where other games like spin-the-bottle or seven minutes in heaven are naive or childish approaches to sexuality, the laughter games seem to tap into something more primal but similarly illicit. Things start getting even more intense when a formerly anti-social girl joins the laughter salons and starts laughing harder and longer than everyone else. This story perfectly captures the lyrical mysticism and strangeness inherent in those bygone teenage summers, and quickly became one of my most favorite in this collection. Other stories in the collection deal with creativity (“In The Reign of Harad IV“), spirituality and belief (“The Tower”), identity (“The Disappearance of Elaine Coleman”), and more. Although at first they may seem gentle and understated, many of them are filled with a creeping tension or an impending sense of tragedy. Few of the stories wear their fantastic nature on their sleeves, but all of them are just a few steps to the left of reality, edging into more unsettling territory. More often than not, it was just enough to get me thoroughly hooked and keep me reading. I thoroughly enjoyed this collection, and look forward to reading more by Millhauser very soon.